Wall's Ice Cream is made here in Miami to our specifications. We ensure that you will always find our ice cream fresh and creamy. Our staff is friendly, courteous and dedicated to make your visit fun. These are just a few examples of our ice cream creations. Bring your family and friends for a great evening of fun! Ask about our catering and events. Three flavors of ice cream, a banana, 3 wet toppings and a dry topping with whipped cream and cherries! Start with a giant chocolate chip cookie. Add 2 flavors of ice cream (of your choice) a wet topping, dry topping, whipped cream and cherries! A giant bowl of peanut butter ice cream, smothered with pourable peanut butter, hot fudge and topped with whipped cream and peanuts. Oh don't forget the cherry! Selzer water and strawberry syrup, with two giant scoops of the ice cream of your choice, topped with whipped cream and a cherry. 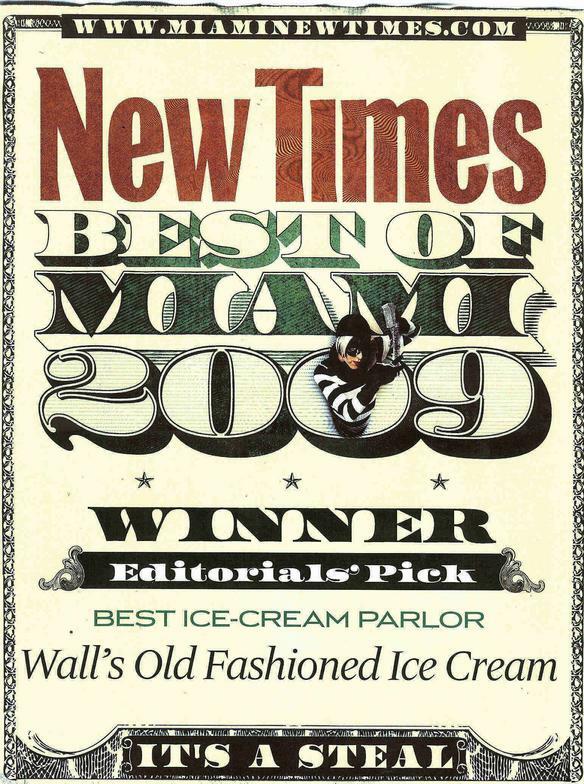 We've been honored as a three time winner of "Best Ice Cream Parlor" in the Miami New Times Magazine.